Well, that didn't take long. 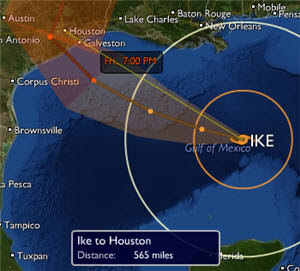 Only hours after inviting you to join me this Saturday for the Houston TechFest, I have just received official word that the event has been canceled due to Hurricane Ike. With wind speeds expected to exceed 100 mph in Houston, many businesses and schools are closing their doors, including the University of Houston where the event was scheduled to take place. Conference organizers plan to reschedule the event, but right now it looks like facilities will not be available 'til late January '09. When the date is re-set, of course, I will give you the details right here on Telerik Watch. On the bright side of this news, you now have plenty of time to schedule your travel to Houston TechFest 2008 2009! I, for one, am off to batten down the hatches, charge the laptop batteries, and get ready for a wet weekend.